Our fate is written in the stars. It's an old story. A Folktale. Perhaps it's a tired Hollywood trope. Or maybe there is no such thing as fate. Maybe everything is free will and every choice we make shatters the future into infinite possibility. The answer is unclear. In Hub Theatre Group’s production of Constellations by Nick Payne, our preconceived notions of fate and destiny are turned on their heads, for better and for worse. In present-day England, a chance encounter between a man and a woman begins a romantic journey that defies the boundaries of what we know and delves into the infinite possibilities offered by quantum physics. Yes, you read that right. 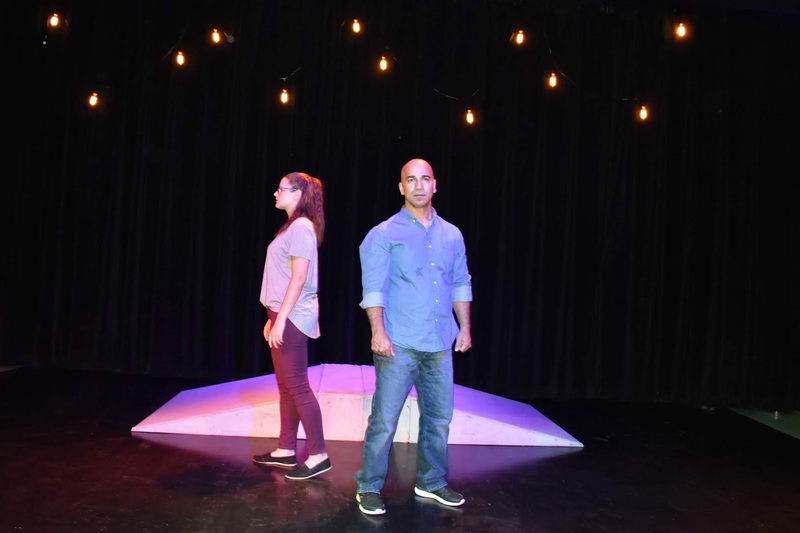 Constellations is both a romantic tale and a crash course in the multiverse theory of quantum physics. What could have been written as a plodding and jargon-heavy theatrical event has instead been massaged by playwright Nick Payne into a play that is sometimes charming, sometimes alarming, at turns heartbreaking and uplifting—almost as if Payne’s script also adheres to the multiverse principle that all possibilities exist at the same time. 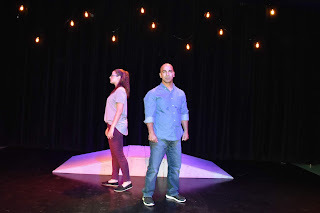 The action unfolds in a series of vignettes, a purgatory with variations, in which we watch Marianne (Allison Roberts) and Rolland (Bob Chanda) live multiple different possibilities of the same scenes of their lives. Sometimes the results are vastly different. Sometimes the only difference is a single word used to describe someone’s crotch. What follows is a look at the sometimes-monumental consequences of innocuous decisions made from minute to minute. which is the point. At one point in the play, Marianne declares “We’ve asked the same questions time after time and come up with two completely different answers.” It is fitting that the play suffers the same fate. In a romantic show such as this, chemistry is everything. Unfortunately for this production, the chemistry between actors is overshadowed by the physics of the universe. The apparent age difference between Chanda and Roberts is jarring, and it provides an early hurdle for the cast to overcome. Thankfully, they mostly succeed in their task. Their relationship is appropriately awkward when it needs to be, passionate in others, and ultimately devastating. Watching these two try and fail to get it right again and again makes the moments where things work out for them all the more precious. Technical elements of the performance are unobtrusive, allowing the script to take center stage. The set is made up of a single ramped platform, and the lights are hung on a string. What could be seen as a minimal design instead opens up the possibilities of the infinite. With little to completely tell the audience where or when we are, director Paula Chanda is free to play with time and space inside a temporal starfield of memory, fate, and destiny. The only real misstep in the direction is that with all the changes and variations from choice to choice, their lives are missing the big peaks and valleys that make existing interesting and memorable. Paula Chanda has instead opted for an understated performance that creeps under the skin instead of exploding in our faces. The real star of the show is original music by Christopher J. Smith. His composition evokes a night sky full of stars and possibilities. The atmosphere shifts seamlessly from comforting clarity to tense dissonance and falls in line with the themes of Payne’s script. In moments where the music is gone, a sense of longing rises, wishing for its quick return. It serves as a safe place, a reminder of where we are in the world. 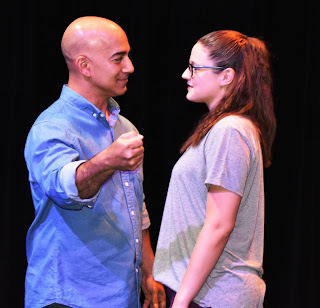 A script that is as smart as Payne’s Constellations doesn’t come around very often, and Hub Theatre Group should be commended for taking on such a play. Whatever its faults, this tale of multiple universes is universal and well worth a trip to look at the night sky.